Summary : One way to measure the prevalence of diarrhea using simple pictures. According to the WHO, diarrhea is “the passage of three or more loose or liquid stools per day, or more frequently than is normal for the individual”. Diarrhea is often a symptom of a gastrointestinal infection which can be caused by bacteria, virus or parasite. It can also be a symptom of other non-infectious conditions such as lactose intolerance, bowel cancer and irritable bowel syndrome, and a side-effect of some medications. There are many cases where you might need to measure the prevalence of diarrhea as part of a survey. For example, if you are running a water, sanitation or hygiene campaign you might want to compare the prevalence of diarrhea before and after the campaign and in areas that did and did not receive the campaign. You might also want to measure it as part of a general survey to assess the health of the population, or as part of a health program targeting children under 5 years. The problem with these questions is that people can have different ideas about what constitutes “diarrhea”, particularly if there is more than one word for diarrhea in the local language. Some people may consider “loose or liquid stools” to be normal, and not report it, while other people may over report. An alternative approach is to use the Bristol stool scale. This scale was tested by Lewis and Heaton at the University of Bristol and was published in the Scandinavian Journal of Gastroenterology in 1997. They found that by using this scale they could identify changes in patient’s intestinal function, which would make it a useful way to identify whether someone has diarrhea. 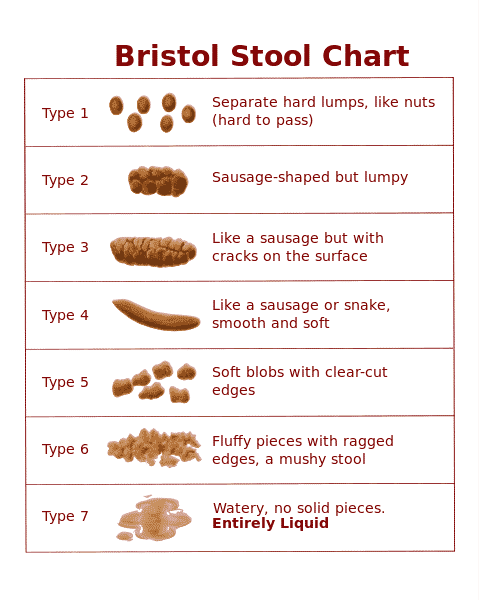 The Bristol stool scale (see below) shows pictures of seven different types of faeces. Type 1–2 indicate constipation, Type 3–4 are normal, Type 5 is normal approaching diarrhea, and Type 6–7 show diarrhea. Type 7 is the most serious watery diarrhea, which can be a symptom of cholera. 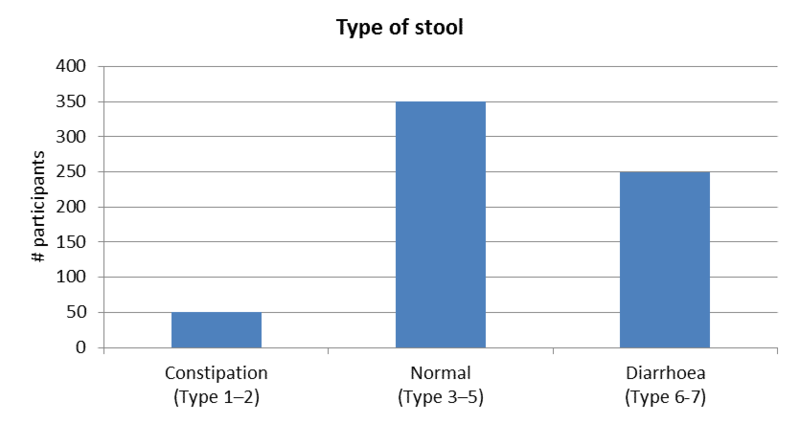 You simply show this chart to the individual responding to the survey and ask them to choose the type that most closely resembles their latest stool. If it is for a young child then you ask the parent to choose which one most closely resembles their child’s latest stool. In 2009, another group of researchers created the Infant Stool Form Scale, which can be used for babies. The scale has a similar set of pictures, but this time of infant stools on nappies. It has three different scales for amount, consistency and colour, which does make it slightly more complicated to use. To get a better understanding of how the scale works in practice, I spoke with Wetlands Work! who have been using the Bristol stool scale to measure diarrhea once a week in floating villages on the Tonle Sap Lake in Cambodia. They are testing whether their new Handy Pod plant and microbe-based treatment system can improve water quality for floating villages, and whether this translates into a reduction in diarrhea. Because they are asking every week they decided to reduce the number of categories in the scale to just three options (Type 3, Type 6 and Type 7). They also created a scale with real photos of faeces so it was more realistic. According to Puthea Khon, who oversees the Wetlands Work! data collectors, most people in the villages find the Bristol stool scale easy to use. Collecting data from children has also been relatively easy. According to Khon “children above five years old can tell the difference of their own poop base on the picture. But we still need some response from their parents.” For children under five years the mother is normally able to answer. Entering and analysing the data has also been easy. The main challenge Wetlands Work! has faced is people getting tired of answering the same question about their faeces every week – particularly in the control village where they don’t see an immediate benefit from the project. This isn’t likely to be a problem if you only survey people once or twice, but it is something to consider if you need to ask them regularly. The results classify people into the seven different types of stools. By grouping together Type 1–2 (constipation), Type 3–5 (normal), Type 6–7 (diarrhea) you can get an indication of how many people had diarrhea at the time of the survey. The result would be a chart similar to the one below. This could be used to decide whether diarrhea is a serious problem in the community that needs to be addressed through a program. If you use the Bristol stool scale before, during and after the program you can measure changes in diarrhea over time. If you have intervention and control areas then you can also compare them, which will show you whether or not the program is working (see chart below). Systematic reviews of diarrhea studies have found that practitioners and researchers use lots of different methods for measuring diarrhea. So although using the Bristol scale might be more accurate than simply asking people if they had diarrhea, it is only one possible method among many and has its own limitations. The scale was developed by physicians to assist them during consultations, rather than by epidemiologists. So although it’s good for getting a quick indication of diarrhea prevalence, it may not be appropriate for academic research studies. It also won’t tell you what bacterial, viral or parasitic organisms caused the diarrhea, and it is based on self-reporting and so there may be some bias in people’s answers. If you use it frequently on the same people then there is also the risk of the Hawthorne effect, where people change their behaviour as a result of being studied. For example, one study found that asking people about diarrhea every two weeks caused them to start chlorinating their water more than another group who were only surveyed infrequently. This could bias the results. The Bristol stool scale is an easy way to measure self-reported diarrhea in a survey, particularly when participants may have different ideas about what “diarrhea” actually means. You need to estimate diarrhea prevalence in a population. 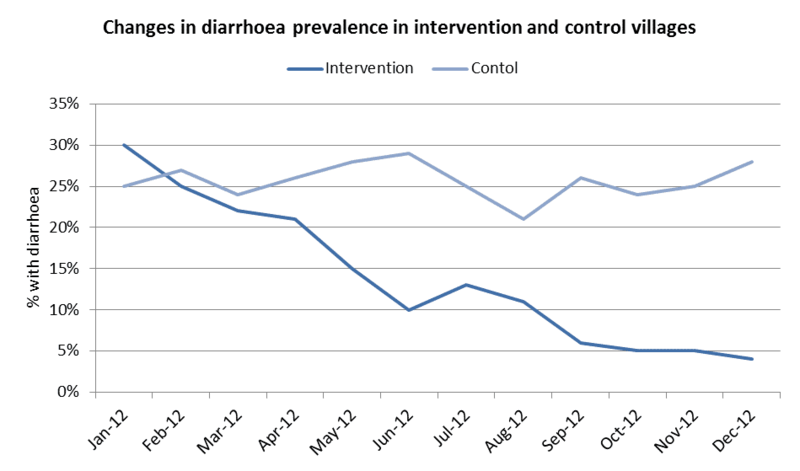 You need to measure large changes in diarrhea prevalence over time or between groups. You have limited statistical and epidemiological skills. The data collectors or program participants have low literacy (the scale is pictorial). You need to measure very small changes in diarrhea incidence or prevalence. You need to know what bacterial, viral or parasitic organisms caused the diarrhea. You are conducting academic research or a detailed epidemiological study that needs to be highly accurate.